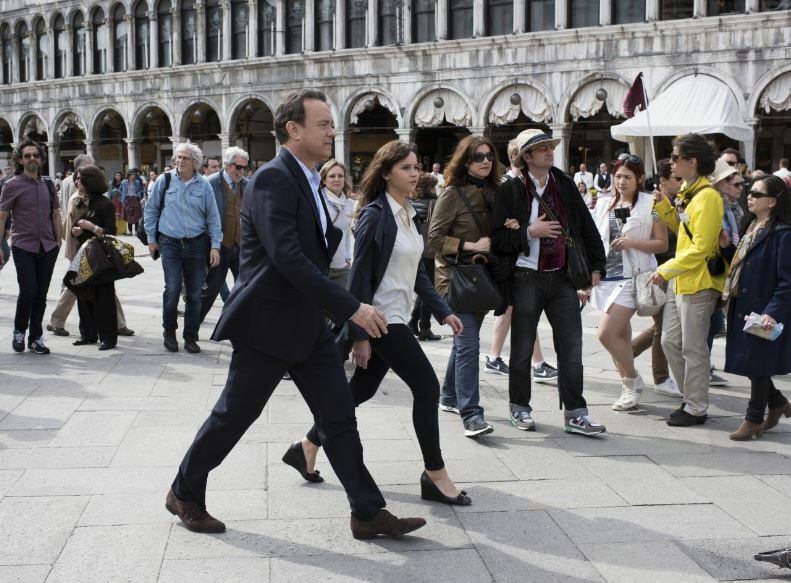 Robert Langdon (Tom Hanks) wakes up in a hospital with a nasty head wound. He remembers nothing of the past 48 hours and does not know where he is or why. He is in Florence, Italy being cared for by Dr. Sienna Brooks (Felicity Jones). As he is starting to remember bits and pieces of the last 2 days…..they are both attacked by gun woman dressed as police. Luckily, they escape to Sienna’s apartment where Robert starts remembering more about his current task. Bertrand Zobrist (Ben Foster) is a brilliant billionaire geneticist (in the book) with a bizarre goal: To wipe out much of the human population in order to save humanity from destroying the earth’s resources. Bertrand set a biological weapon to go off at Midnight in a few days, but, no one knows where it is. To keep the location secret….Bertrand does a swan dive off of a building and dies. The only clue to the location is a projection of Dante’s Inferno in Robert Langdon’s possession, and the only person who can decipher the clues to save the world is Langdon. Sienna and Robert embark on a worldwide hunt to stop the release of the deadly pathogen. “Inferno” is an interesting, action packed, movie based on the Dan Brown book of the same name. There are shocking twists and harrowing close calls. The movie is slightly different than the book in some areas. We liked it, but a lot of “reviewers” did not. Boo on them as they probably did not watch it, just copied others dissing something they did not see. Lemmings. Rated PG-13. Go to IMDb for more information. We watched this on Google Play using our Chromecast.